IT’S COMING TO the end of the college year, so in educational institutions across the globe grannies and grandads are dropping dead, and tummy bugs are spreading like wildfire. One Irish professor working in the US has had enough, dammit. Did you hear the man? 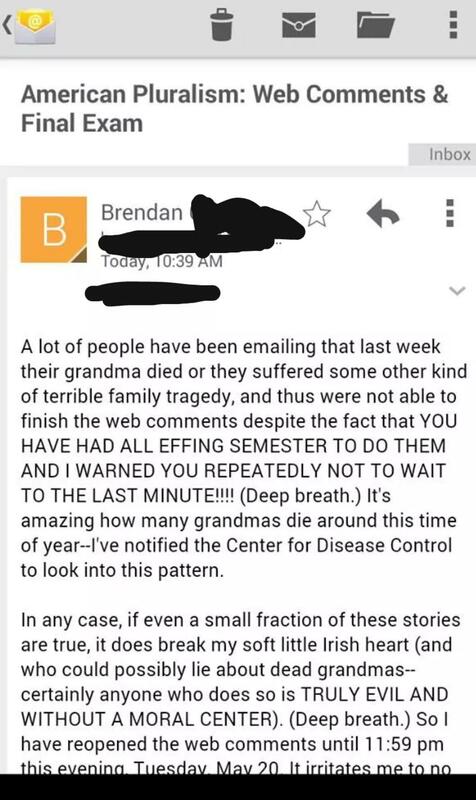 YOU HAD ALL EFFING SEMESTER TO DO THEM AND HE WARNED YOU REPEATEDLY NOT TO WAIT TO THE LAST MINUTE! Listen, unless you’re Ferris Bueller, nobody’s buying this stuff. Do the work, finish the year, and go on your merry way.